This is one of the rare spots in Cologne where you can see people actually reading a newspaper (on paper, not on their phones!) 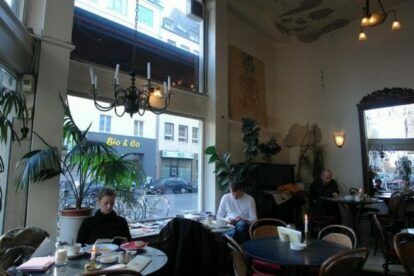 – they have a variety of newspapers for you to read while drinking a coffee. You find students discussing something, let’s assume it is Foucault. The interior seems as if it was taken out of some Parisian quartier a lifetime ago. Whenever I feel like I need to channel some French vibes, this is the place I go to. There is no feeling of hecticness or busy-ness at all. The atmosphere is welcoming for people who want to spend some time alone, as well as for a group of friends. They serve good coffee and offer a large selection of breakfast. Good news for everyone who loves breakfast-food all day long: they serve it until the afternoon. And is there something better than pancakes in the afternoon with a nice touch of joie de vivre?